Our artist's impression of the new Miles "Falcon" ("Gipsy Major"), as it will look with its redesigned windscreen. 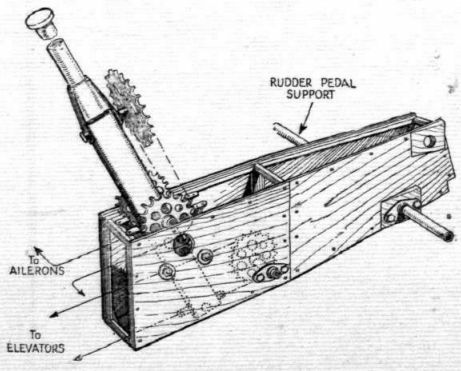 Details of the central control box, carrying the hinged control column and the support for the two pairs of pedals. 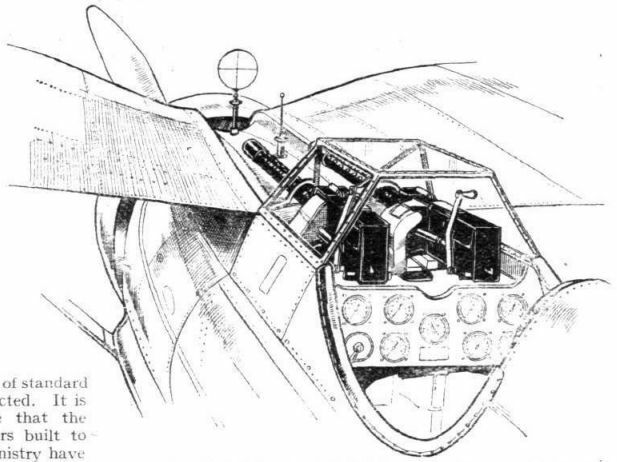 Hingeing of the column in this manner provides full aileron movement without incommoding the passengers, although the column is between them. 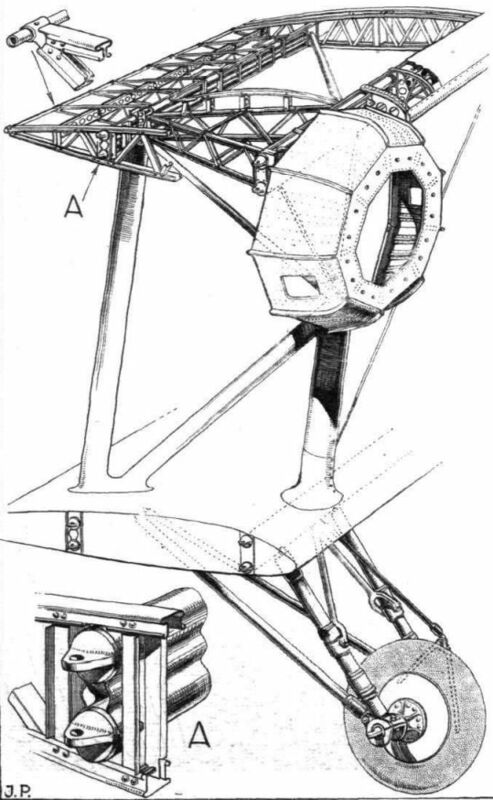 Structural details of the cabin, showing the formation of the windscreen. 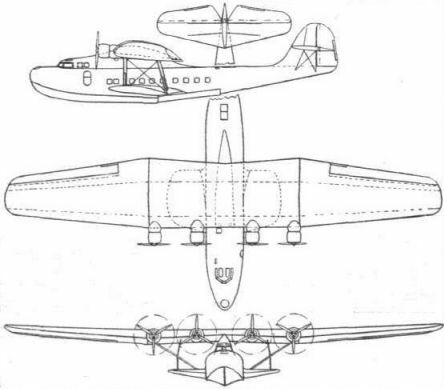 Part of the starboard wing flap is shown; the flaps are of the balanced type, with the centre balance portion operating forward, and thus in the opposite direction to the main flaps. A Four-gun Fighter: Four machine guns are carried on the Letov S.231. 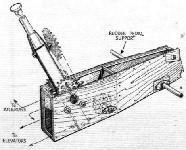 This diagram shows the disposition of armament in the Amiot 143M. Members of the crew occupying alternative positions are indicated by dotted lines. 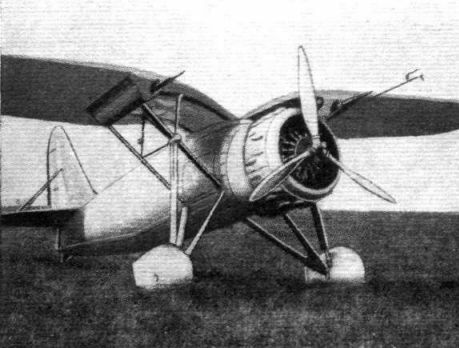 French bicanon single-seater: The Loire 46C.1, with small-bore quick-firers mounted in the wings. 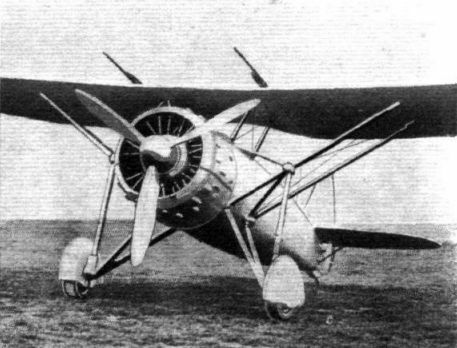 French bicanon single-seater: The Dewoitine D.372, with small-bore quick-firers mounted in the wings. 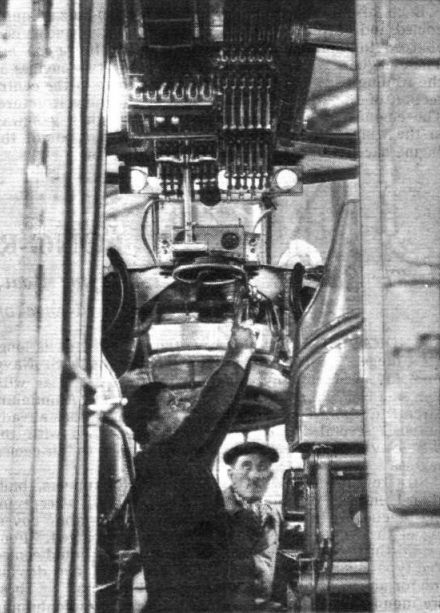 The mounting of one of the canons in the P.Z.L. P.24. Seldom before can so many aircraft of an unorthodox type have been seen gathered together at one time. 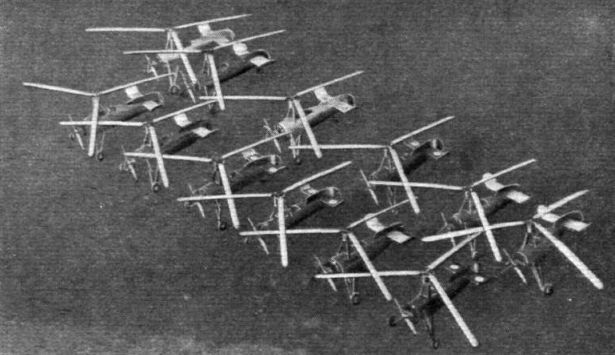 This Flight photograph, taken at Hanworth, shows a batch of Autogiros destined for various places in Great Britain, France, Germany and Spain. A CHINESE PUZZLE: Not a swarm of insects, but an aerial view of the International (British, French, German and Spanish) Autogiros at Hanworth. Artillery Reconnaissance: This "Audax" of No. 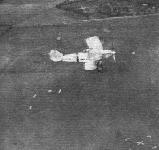 16 (A.C.) Squadron is practising with a puff target. 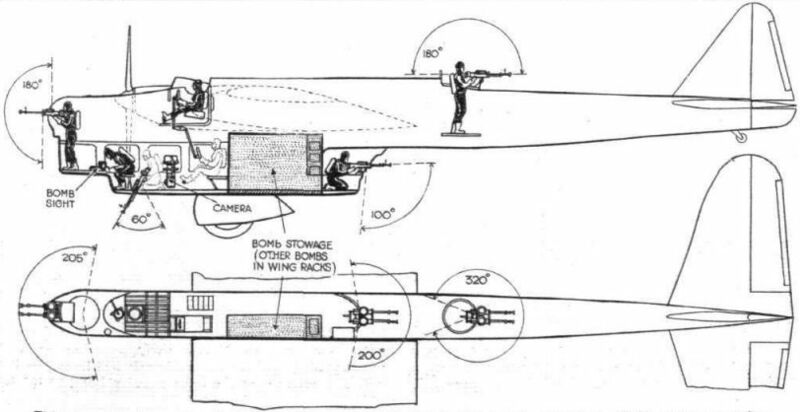 The smoke puffs are exploded from the ground to represent shell-bursts, and the pilot sends down a wireless observation after each salvo until he has directed the battery on to the target. 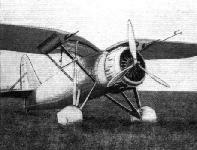 This machine is flying comparatively low in order to appear in the photograph. In Echelon: A Flight of No. 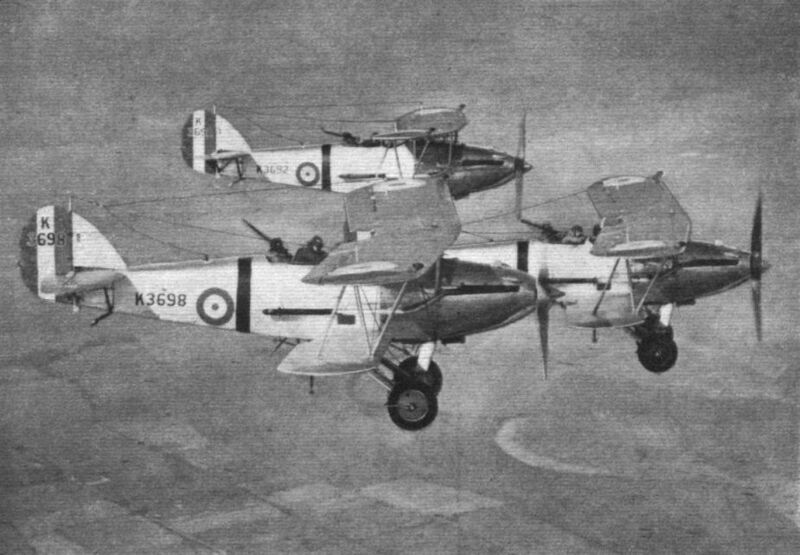 16 (A.C.) Squadron Hawker "Audax" machines (Rolls-Royce "Kestrel"). Группа Audax из 16-й эскадрильи взаимодействия с армией Королевских ВВС. Самолеты этого типа несли службу как в самой Британии, так и на Ближнем Востоке и в Африке. 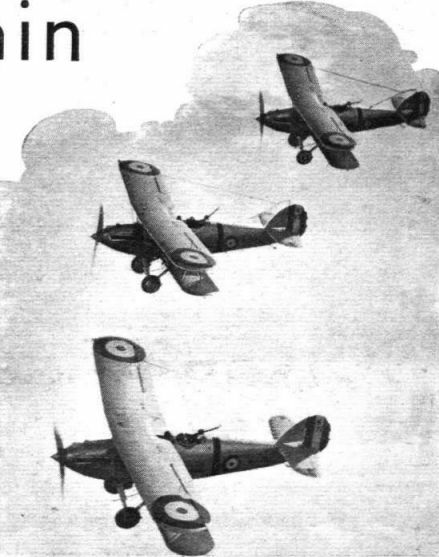 THE ARMY'S OPTIC NERVE: A flight of three Hawker "Audax" machines (Rolls-Royce "Kestrel"), of No. 16 (Army Co-operation) Squadron, which is stationed at Old Sarum. 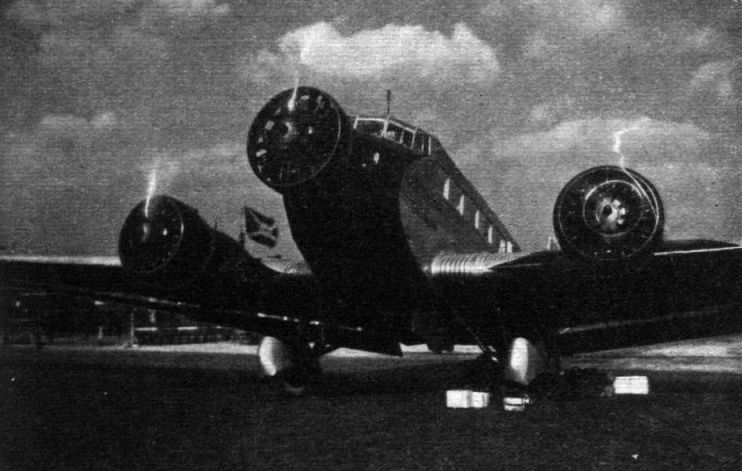 One of the "Singapore III's" taking off in a 25-knot wind. The "unstick run" is very short and the absence of spray noticeable. UNIQUE: The floating seaplane dock at Pembroke is unique in being the only one of the type in the world. It can be sunk to take any vessel, seaplane or flying boat up to a draught of seven feet. Four adjustable jacks are provided, also workshops capable of undertaking extensive repairs. It will accommodate two flying boats at one time. On the dock is one of the four Short "Singapores" which left for the Far East on Tuesday Commanded by Fit. Lt. H. A. Castaldini (Retd. ), who was in charge of all the water transport during the last Schneider contest, the dock is a model of efficiency and tidiness. The flagship of the Squadron receiving its final attentions on the floating dock. 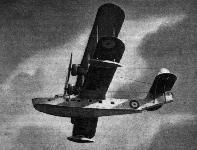 This "Singapore III" had already done some 180 hours' flying, including taking Sir Philip Sassoon out to the Near East. Sqd. Ldr. Lang at the controls during a test flight. FOR OPEN-SEA RECONNAISSANCE: The new Vickers-Supermarine flying boat, fitted with two Bristol "Pegasus" engines. 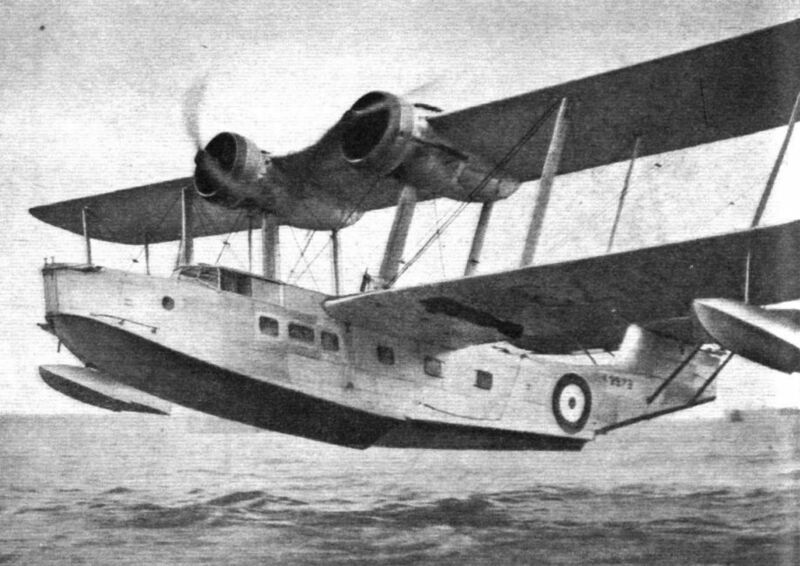 HIGH-SPEED SERVICE DEVELOPMENT: In a leading article last week Flight called attention to the threat to British commercial flying boat supremacy. 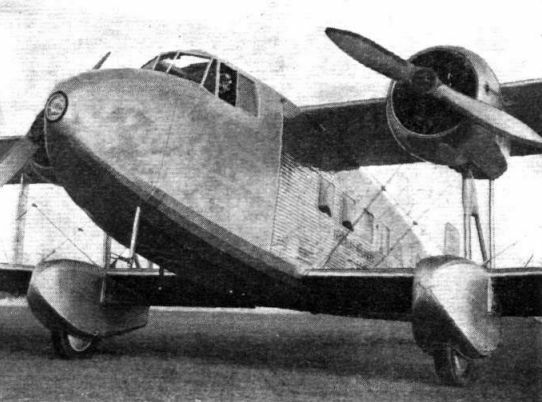 On the Service side progress is steadier, and the new Vickers-Supermarine flying boat (Bristol "Pegasus" engines), shown in this remarkable photograph, is one of several types now undergoing trials. 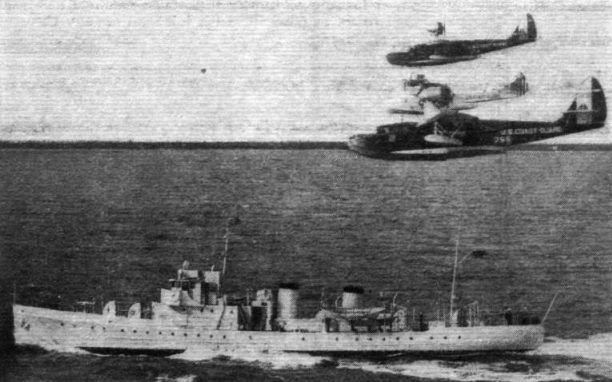 NOT THE "MAYO-SHORT" COMPOSITE AIRCRAFT, but three Miami Coast Guard machines - the Arcturus, Acanar and Sirius - saluting the U S. patrol boat Pandora, The two larger machines are G.A.F-15 flying boats, while the third is a Douglas "Dolphin" amphibian. CATAPULTABLE. 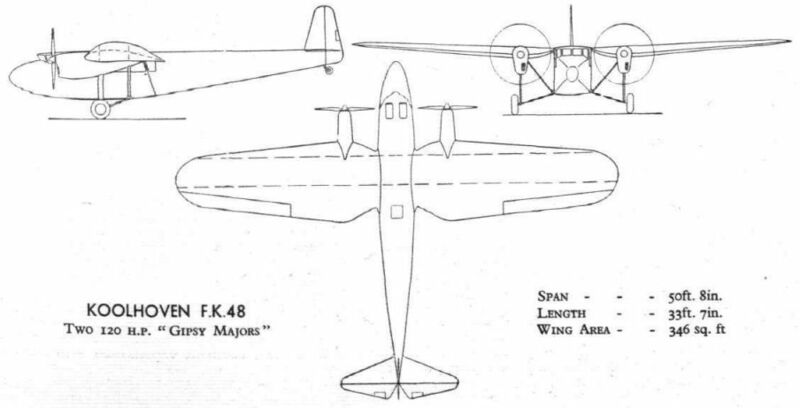 The Potez 452 shown here is designed to be catapulted from naval vessels. 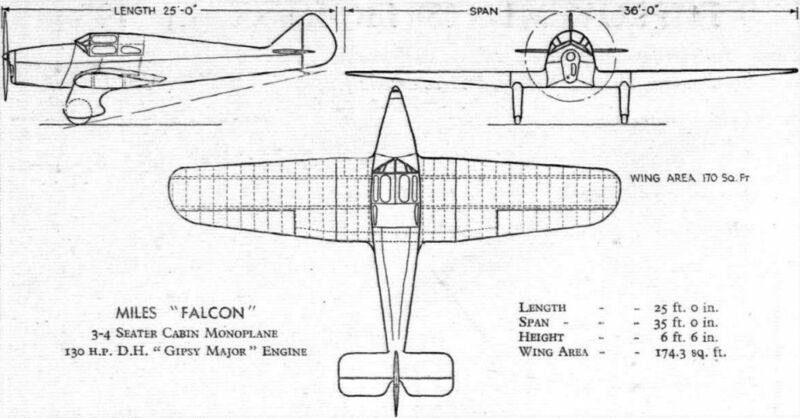 Its wings are arranged to fold and a Hispano Suiza 9Qd radial of 600 h.p. gives it a maximum speed of 137 m.p.h. The Douglas at Gravesend. 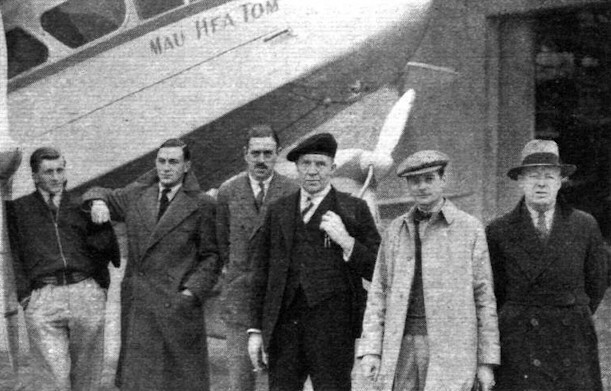 Below the machine can be seen Mr. Anthony Fokker, Mr. H. Gooding (the Gravesend manager), Mr. Parmentier and Mr. Prins. CHILE! 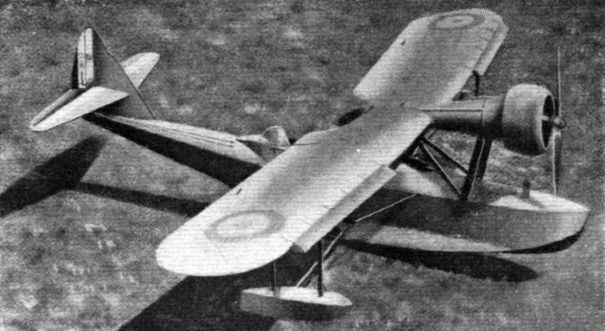 This Avro 626 (Siddeley "Cheetah") training machine was flown over the Andes in mid-winter by Mr. H. A. 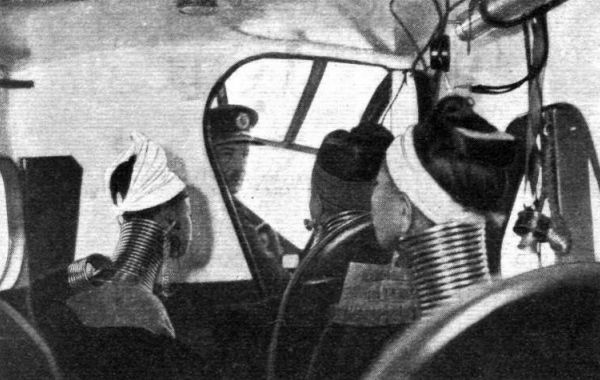 Brown, the makers' chief test pilot, accompanied by his engineer, Mr. Harper. 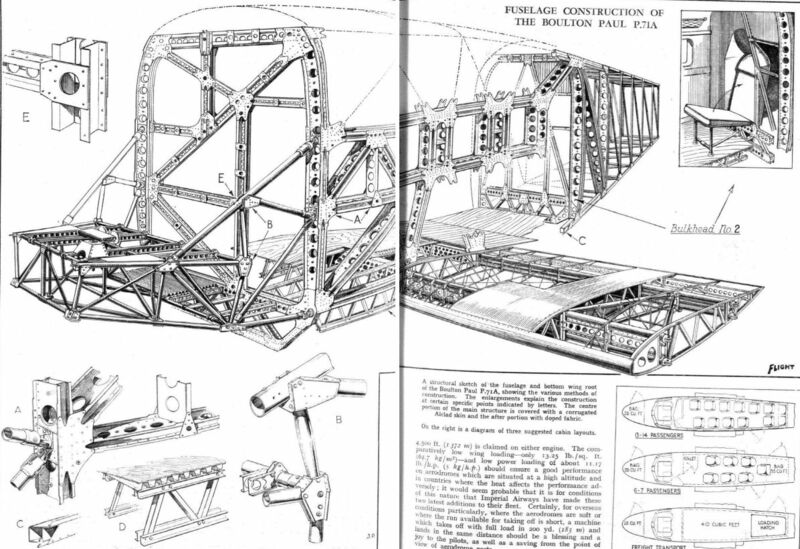 It was necessary to cross the range at 18,000 ft., and the machine was loaded to a gross weight of 3,250 lb. 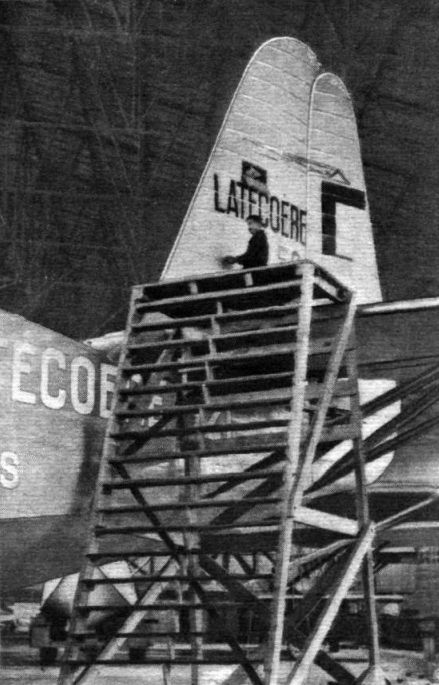 The "626" was the first of its type to be delivered to the Chilean Air Force. 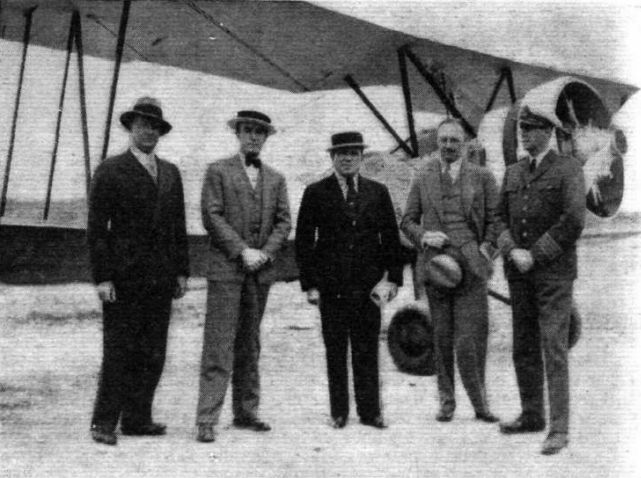 This group, taken at Santiago de Chile, shows (left to right) Senor Paul Besa, Commodoro Franki, Commodoro Don Diego Aracena (Chief of the Chilean Air Force), Mr. Brown and Commandante Castro. The "Gipsy" engines give the Dutch Koolhoven F.K.48 a top speed of 130 m.p.h. Koolhoven F.K.48 Two 120 h.p. 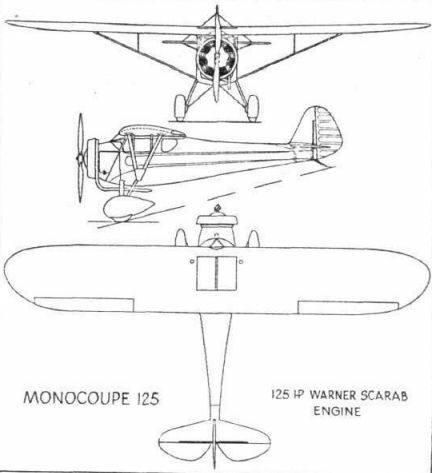 "Gipsy Majors"
Monocoupes: (Top) Models D.145 and 125, and (bottom) the De Luxe Model 90, one view showing the trailing edge flaps which give a landing speed of 40 m.p.h. 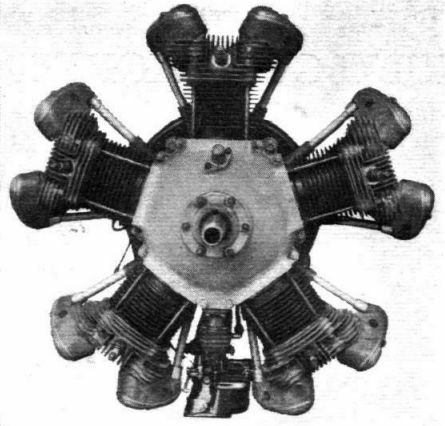 A Light American Radial: The Lambert R.266 engine gives 90 h.p. at 2,375 r.p.m. WHAT OF 1935? Last year Jersey Airways carried more than 20,000 passengers, using eight "Dragons." 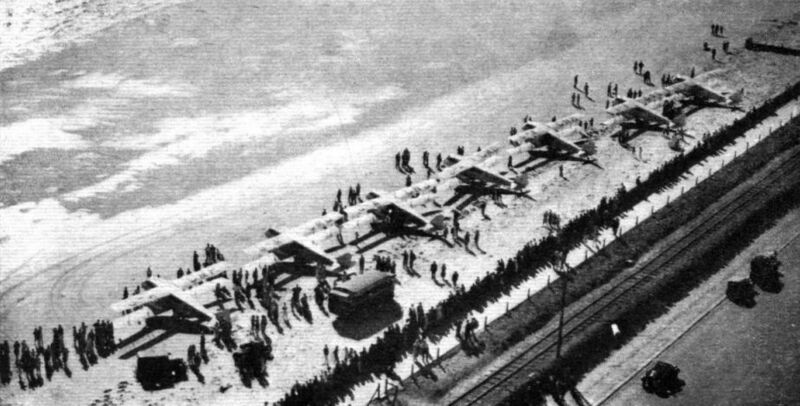 Here are seven on the beach at St. Helier; the charabanc "waiting room" in the middle foreground was lost at sea soon after this picture was taken! The cause was a high tide. AN ALTITUDE RECORD? These three much-photographed ladies from Bermuda - who are appearing at Bertram Mills' Circus at Olympia - made their first flight last Sunday, in a Hillman "Dragon." 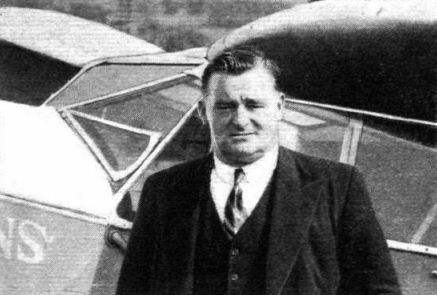 The late Mr. Edward Hillman with his first "Puss Moth" at Maylands aerodrome. 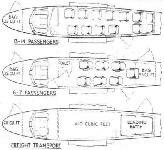 A sectional view of an S.74's fuselage, showing the underfloor luggage hold. A JAPANESE FLEET FIGHTER: The Nakajima type 90 shipboard fighter, fitted with a 450 h.p. Nakajima "Jupiter." 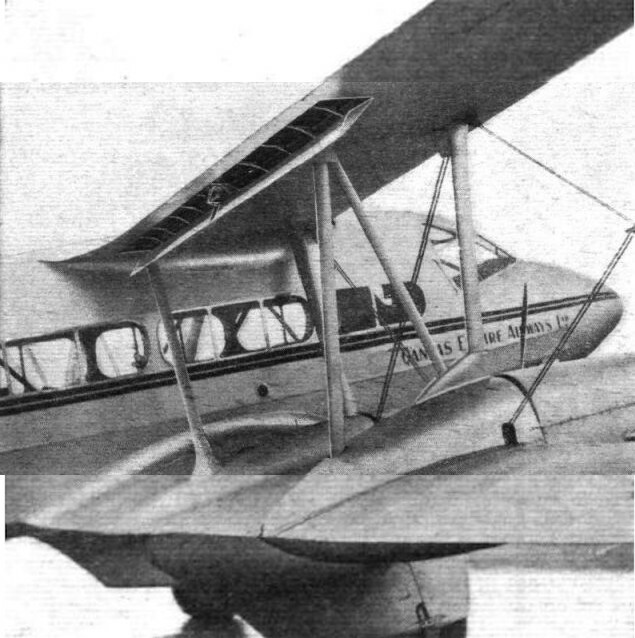 A side view of the "Lynx"-engined "Envoy" R. K. Dundas Ltd. are the Airspeed agents. 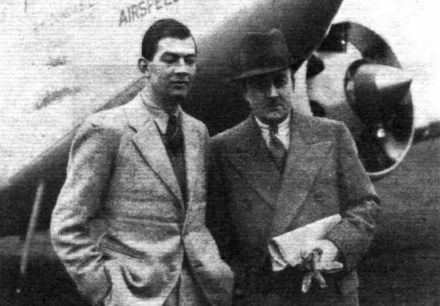 Sir Alan Cobham (right) with his pilot, Fit. Lt. H. C. Johnson, who is flying the "Envoy" to India. 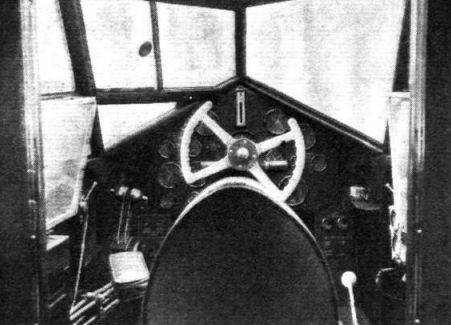 A view forward into the pilot's cockpit; the handle on the right of the seat is for raising or lowering the undercarriage. 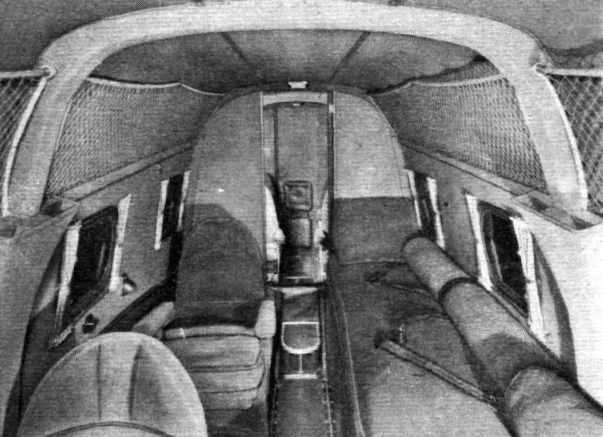 Looking aft in the "Envoy" Cabin. 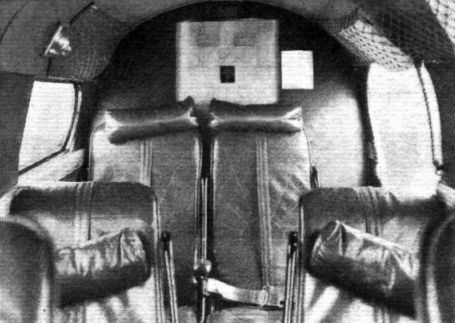 Let into the bulkhead is the Plessey A.C.44 wireless set. FOR THE PACIFIC? The big Martin flying boat, several of which are on order for Pan American Airways, on test near Baltimore. 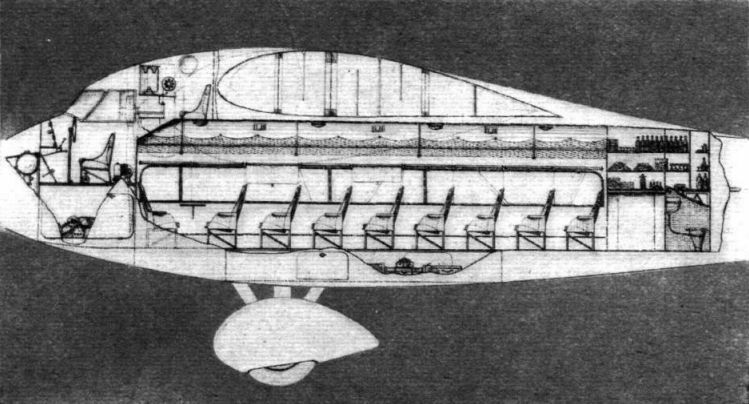 On its first test flight the "Clipper" left the water in twelve seconds, flying "light." SILENCING of aero engines is receiving a great deal of attention at the present time. 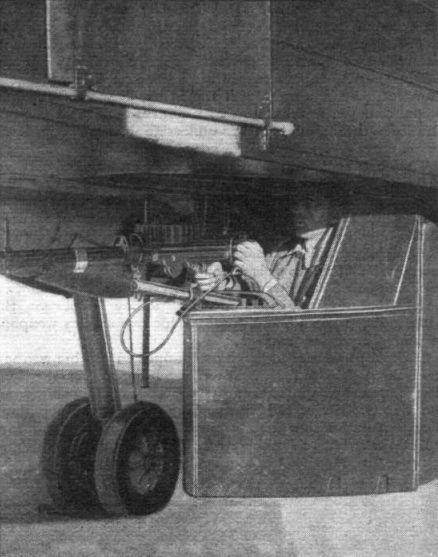 In Flight for September 27, 1934, tests with the Vokes silencer were described. Here is a photograph of one of the same make fitted to a "Fairey III.F." A FINE FLIGHT: The K.L.M. 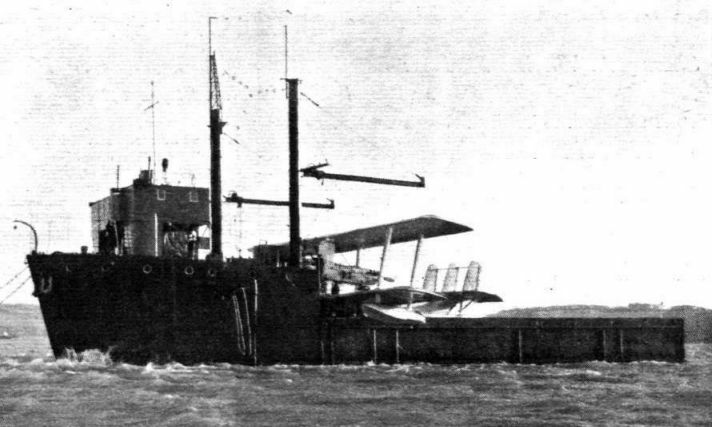 Fokker, Snip, which, piloted by Mr. J. J Hondong, left Amsterdam with Christmas mails on December 15, and, flying over the South Atlantic via Cape Verde Is., reached Paramaribo, Dutch West Indies, on December 17. It is here seen beside the Shell depot at Casablanca. FOR A.B. 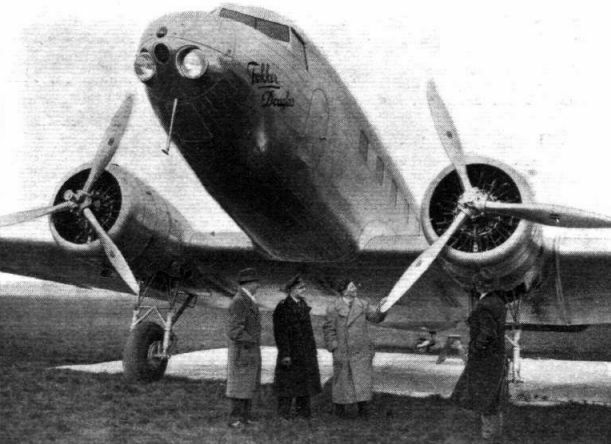 AERO-TRANSPORT: The first of the new Fokker F22S (four P. and W. 525 h.p. "Wasps,") which has successfully passed its tests. Three of these 23-passenger machines will also be supplied to K.L.M. In this view are shown the essential features of the structure which combines the engine mounting and the undercarriage. Both sides are identical. The shock-absorbing rubber blocks are carried in each of the rectangular undercarriage legs. 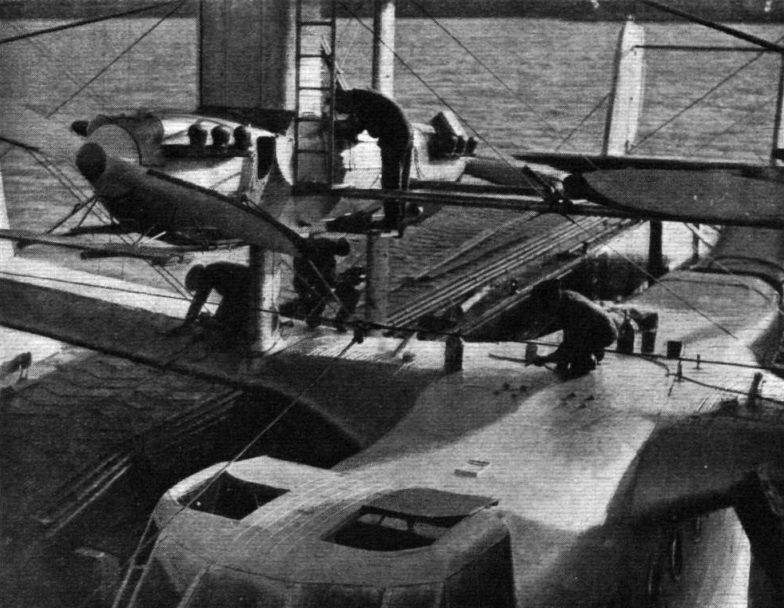 An outsize in aircraft: The big Latecoere flying boat at the Biscarosse seaplane base during its trials. 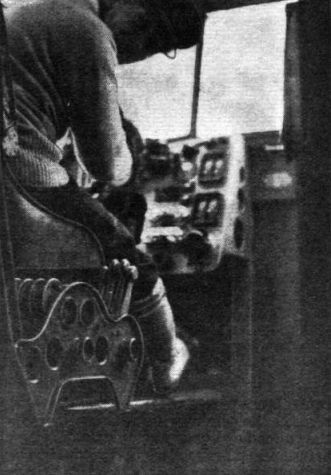 A symphony in knobs: The pilots' compartment of the big Latecoere, suggestive of the interior of a submarine. This view shows that the pilot has an excellent outlook forward. 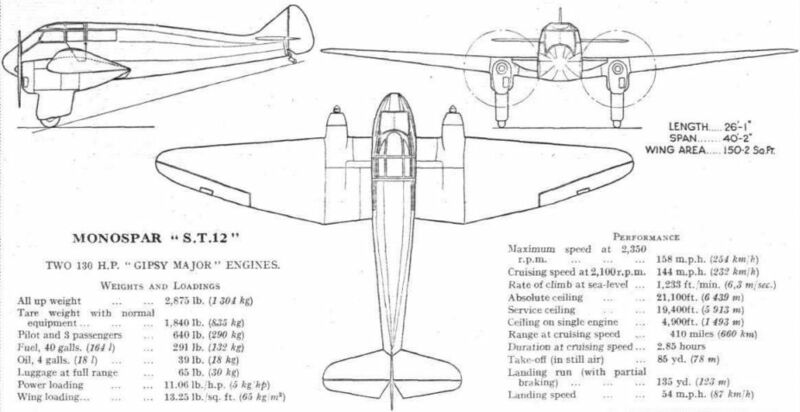 J. D. North's efforts at achieving minimum drag are obvious in this view of one of the P.71As. 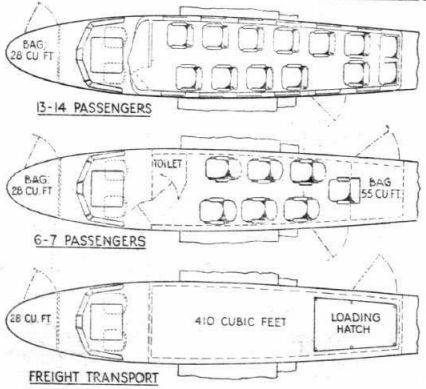 A diagram of three suggested cabin layouts. 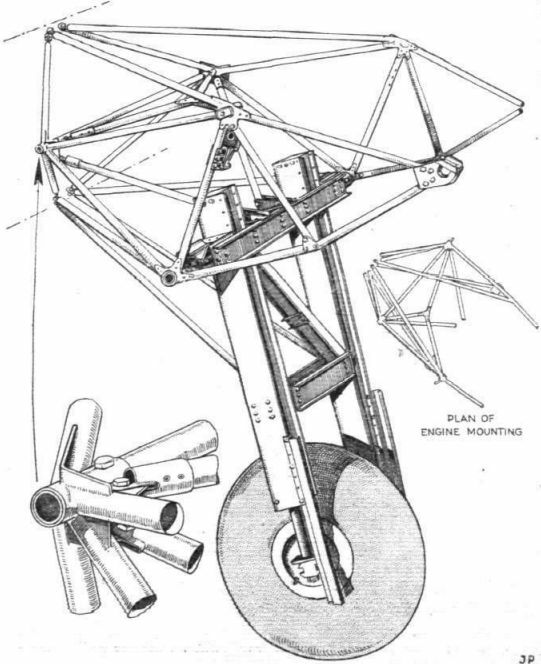 Structural details of the engine mounting and undercarriage. 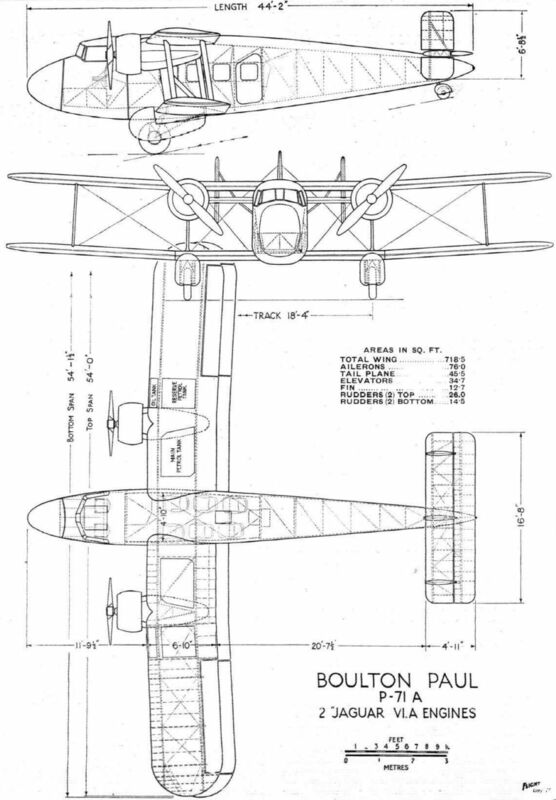 A structural sketch of the fuselage and bottm wing root of the Boulton Paul P.71A, showing the various methods of construction. The enlargements explain the construction at certain specific points indicated by letters. 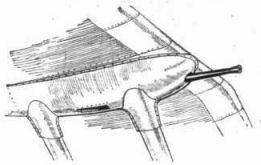 The centre portion of the main structure is covered with a corrugated Alclad skin and the after portion with doped fabric. 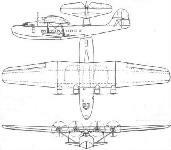 WITH SINGLE-SPAR WING. 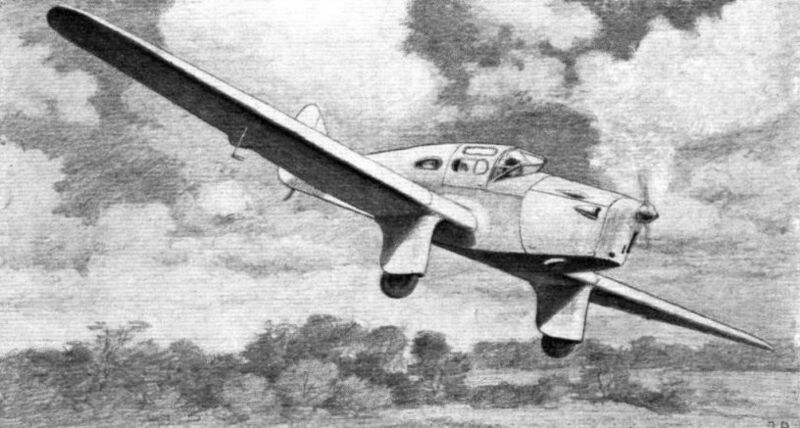 The Italian Bergamaschi P.S.1 monoplane is a four-seater with a Fiat A.70 200 h.p. radial. 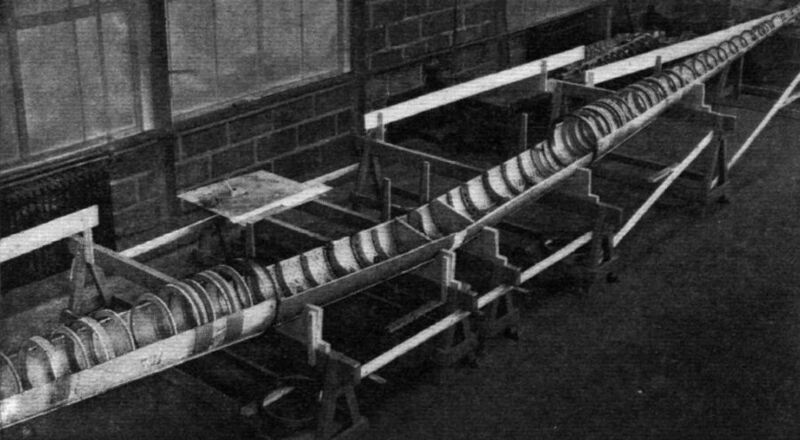 A single spar, manufactured from steel tubes, is used for the wing. A top speed of 161 m.p.h. is claimed and the stalling speed is given as 37 m.p.h. 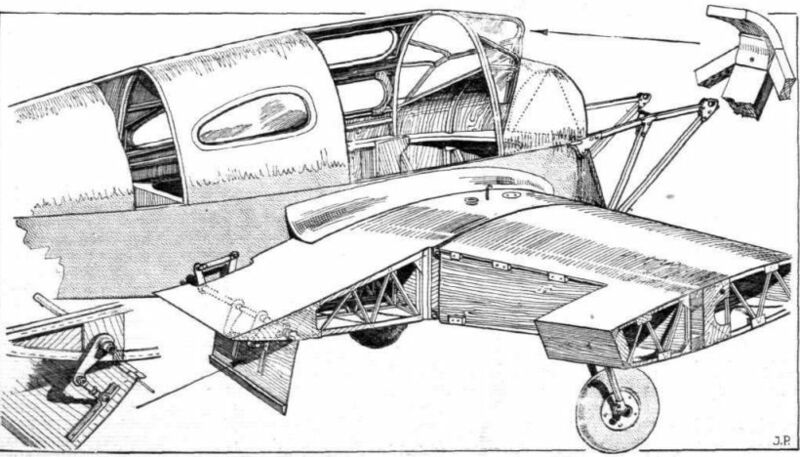 The undercarriage is retractile. 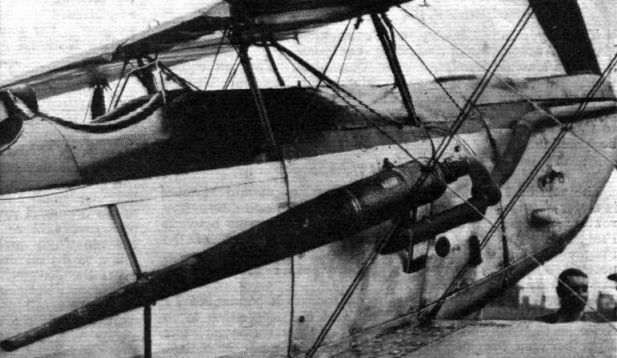 A gun position at the rear of the hanging "car" of the French LeO.208 bomber.